Insect pollinators are vital to the existence of almost 90 percent of the world's flowering plants, including a large portion of food products. Blueberries and cherries, for instance, depend on honey bee pollination. 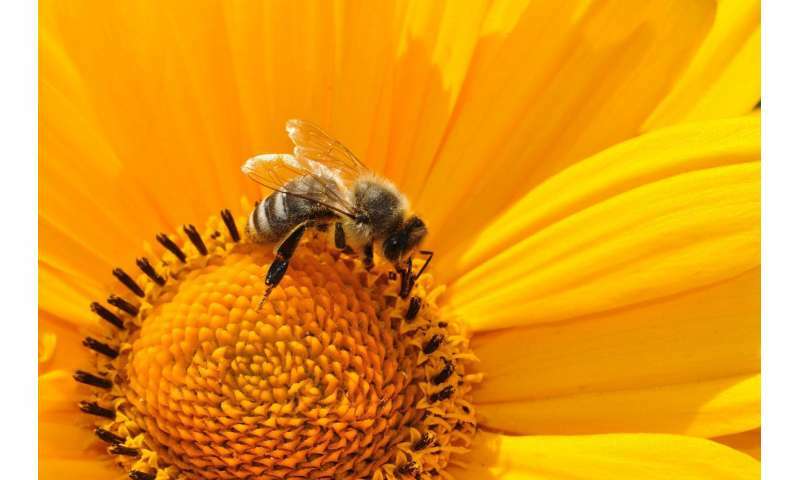 But pollinator populations are falling amid what has been termed an "insect pollinator health crisis," and in the absence of sweeping international or federal action on this issue, it falls to state legislatures to come up with innovative solutions. "To monitor a problem of this scale, we need to be able to see what kind of progress we are making across the country," said Damon Hall, an assistant professor jointly appointed in MU's School of Natural Resources and the College of Engineering. "Until now, no one had put together a complete collection of legislation covering all 50 states. This creates a problem, because how do you write effective laws without knowing what has come before in other states?" "We are seeing encouraging policy innovations, but there is no momentum in state legislatures to adequately monitor this crisis," Hall said. "Wild pollinating insects, like native bees, are wildlife to be managed like any other kinds of wildlife, and that means we need data to track population declines and to start experimenting with different types of land-use programs. Without data, we don't have answers because we don't know which questions to ask, and without a legislative push to fund that data collection, we are spinning our wheels." The study, "Insect pollinator conservation policy innovations: lessons for lawmakers," was published in Environmental Science and Policy. Rebecca Steiner of Saint Louis University and Lewis & Clark Community College also contributed to the study. Support was provided by the Center for Sustainability at Saint Louis University and the Missouri Department of Conservation (cooperative agreements 336 and 359). The content is solely the responsibility of the authors and does not necessarily represent the official views of the funding agencies.